Regrettably, from now on, only one chart will be commented each day on this blog. 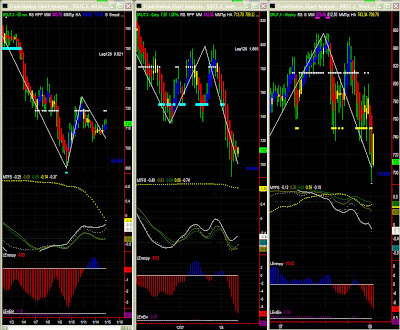 I shall alternate between SPY, RUT and NDX, and the other 2 snapshots will be posted uncommented. Fortunately, those 3 symbols are fairly correlated. I shall think of another way of providing this service to those who really appreciate it. the upper bias in MTFS and absence of energy in Entropy do not make this short term recovery convincing at all. 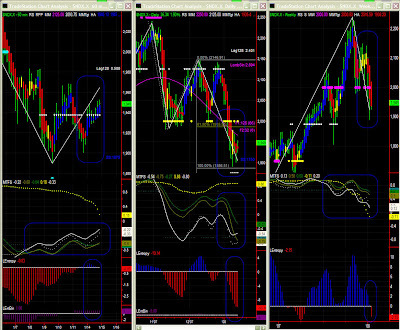 Short intraday time frames look a little better, but recovery could very well fade fast. MTFS is in congestion with lower bias mode, so the pattern must complete in oversold territory now without necessarily going much lower. Entropy is close to a bottom though, and since the Fib pattern seems to have found its target earlier on, one may have a good recovery once negative pressure is fully exhausted. Volatility has always been a wild card with NDX so it may take anything up to a week to materialise. As mentioned recently, bull mode is over and we are now in correction mode (not bear mode yet though), and one can notice that the Swing indicator has been relatively hesitant at this level. I recommend taking cues from MM and Fib levels at this stage. The Swing indicator is way too steep to be stable (~ 3 times the natural angle of repose), so we know we have to wait for volatility to calm down a bit. Note: this proprietary Swing algorithm differs from conventional algorithms which always toggle in lower time frames first. 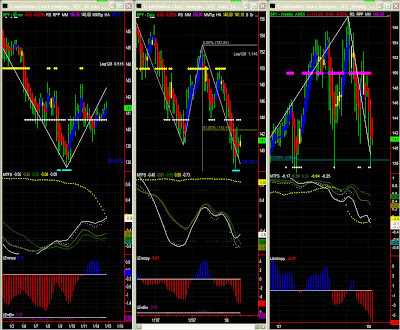 We are in this instance probably close to a key level at this time frame.